The PowerEgg from Power Vision is more than just a drone: It is a centerpiece. When not in flight, the craft transforms into a nearly seamless egg shape that rests in an included stand for prominent display. 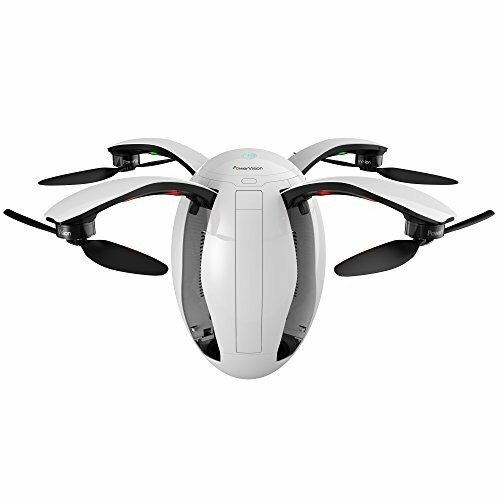 It features the Maestro, a gesture-based controller designed to give users an intuitive, easy-to-learn flying experience. As an alternative, it also comes with a traditional "transmitter"-style controller with dual sticks for conventional RC piloting. However you choose to fly, you will be able to record the experience with a built-in 14MP photo / UHD 4K video camera with 3-axis gimbal. Revolutionary design, feature-rich and intuitive with a unique egg-shaped exterior. The PowerEgg Maestro, a gesture-based one-handed controller provides worlds’ first gesture based control w/ motion-sensing capabilities, allows users to interact with and manipulate the drone in flight. Explore from a distance with real-time HD video transmission of up to approximately 3.1 miles.